A major scale may be seen as two identical tetrachords separated by a whole tone, or whole step, the new set of steps "Whole:Whole:Half:Whole:Whole:Whole:Half"(in Semi-tone 2 2 1 2 2 2 1). Each tetrachord consists of two whole steps followed by a half step. Western scales do not skip any line or space on the staff, and they do not repeat any note with a different accidental. This has the effect of forcing the key signatus. The Circle of Fifths, first described in 1728 by Johann David Heinichen in his book Der General-bass, has been used ever since as a means of illustrating the relative harmonic distance between musical keys (Drabkin 2001). 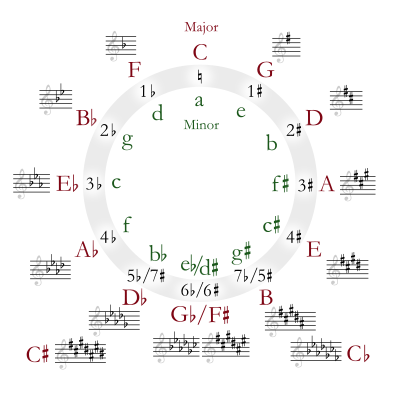 The numbers inside the circle show the number of sharps or flats in the key signature, with the sharp keys going clockwise, and the flat keys counterclockwise from C major (which has no sharps or flats.) The circular arrangement depends on enharmonic relationships in the circle, usually reckoned at six sharps or flats for the major keys of F♯ = G♭ and D♯ = E♭ for minor keys (Drabkin 2001). Seven sharps or flats make major keys (C♯ major and C♭ major) that may be more conveniently spelled with five flats or sharps (as D♭ major or B major). The major scale may predominate the minor scale in Western music because of its unique harmonic properties ; in particular the major third is much stronger in the harmonic series (it is the 5th, 10th and 20th harmonic – see below) than the minor third (the 19th harmonic). Drabkin, William. 2001. "Circle of Fifths". The New Grove Dictionary of Music and Musicians, second edition, edited by Stanley Sadie and John Tyrrell. London: Macmillan Publishers. Kennedy, Michael. 1994. "Key-Signature". Oxford Dictionary of Music, second edition, associate editor, Joyce Bourne. Oxford and New York: Oxford University Press. ISBN 0198691629. This article is licensed under the GNU Free Documentation License. It uses material from the Wikipedia article "Major scale". Allthough most Wikipedia articles provide accurate information accuracy can not be guaranteed.